Being Frugal and Making It Work: February #LoveMe Challenge: Day 15! Day 15 in the #LoveMe Challenge is to share something that I've done right. I'll admit that I've made a lot of mistakes through the years, but I've also done many things right. It's all part of growing up - because we all know that nobody is perfect. 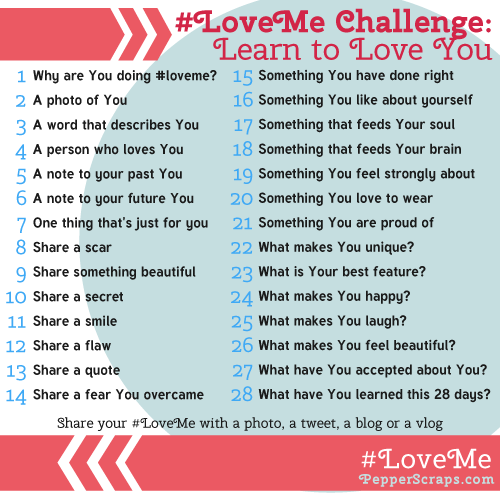 The #LoveMe Challenge originated over at Pepper Scraps, to learn more and join us - be sure to check it out! By joining the #LoveMe Challenge today, you can learn more about yourself by sharing with others. Love your answer. Mine was raising loving children. I love this challenge. Most of the time we don't give ourselves enough credit for all the good we do and instead focus on the negative. I know I've done right in raising my son to be a respectful young man. Being true to yourself is so important &is definitely not always easy! Well I feel like a total failure because I couldn't keep up with this challenge. :/ Maybe I'll have a few minutes to spare tomorrow and just do days 4 thru 17 up in one post. Sigh. I love your quote! I love that quote. Reminds me of the talk we heard at church today about being faithful to death. Sometimes we don't actually die for what we believe in but when we make the determination against seemingly insurmountable odds that we are willing to die for our faith then it's as if we've been to the brink and been "resurrected".